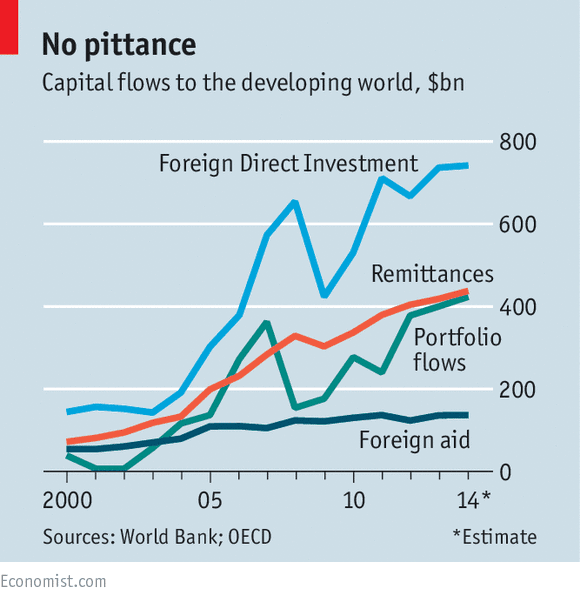 So globally, remittances by migrants are now worth more than double the total flows of foreign aid and more than portfolio flows (financialised investment). In fact, remittances are now second in importance to only FDI. The latter fact is not surprising as remittances already were second largest source of capital inflows for developing countries at the start of the century and even before (see more on this here covering data until 2000). Interestingly, at variance with the above chart, evidence before 2000 suggests that remittances were negatively (though not statistically significantly) correlated with private capital flows. It appears this negative correlation has been substantially reversed in post-2000 period. Another study looked at the effect of remittances in Sub-Saharan Africa - the world's poorest region overall, where foreign aid is a very important driver of 'official' development. The study (link here) found that "remittances, which are a stable, private transfer, have a direct poverty mitigating effect, and promote financial development. These findings hold even after factoring in the reverse causality between remittances, poverty and financial development." Globally, the same was established based on pre-2000 data (link here). A 2009 paper ties remittances (positive effect on long-term growth in the receiving economy) to the degree of development of financial services in the economy (a factor that positively reinforces growth effects of remittances) - details of the study here. Which is sort of a good thing, as remittances themselves promote financial services development (see a study covering 1975-2003 period here). there is significant country heterogeneity in the poverty reduction impact of remittances' flows. ...While remittances tend to have positive effects on education and health, this impact is often restricted to specific groups of the population." To make things a little better for the case of remittances v growth, another study (like IMF reliant on modern econometric techniques) looked at the causal links between remittances and growth in Latin American countries. The conclusion (see link to the study here) is that "remittances have a positive and significant effect on economic growth in both groups of countries. ...the impact of remittances is more pronounced in the presence of the financial development variable." The latter bit confirms evidence referenced earlier. IMF study is also (weakly) contrasted by the 2006 paper (link here) that found that controlling for endogeneity "...remittances exert a weakly positive impact on long-term macroeconomic growth." One of the common criticisms of official foreign aid is that it fuels corruption and graft. Surprisingly, there is some evidence that remittances too achieve the same impact on key institutions in the recipient country. IMF study (see link here) found that "a higher ratio of remittances to GDP is associated with lower indices of control of corruption, government effectiveness, and rule of law."